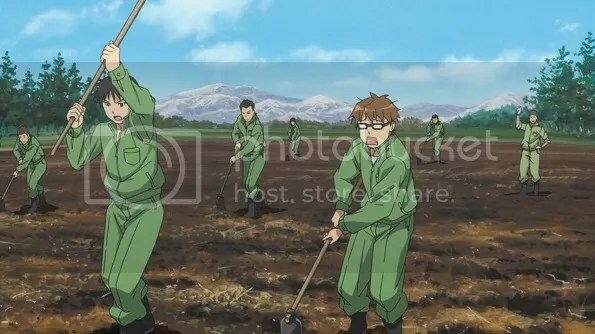 Notice how Hachiken is the only one who has to walk. 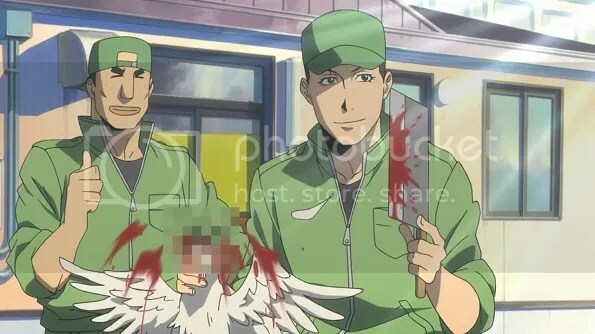 Gin no Saji: Silver Spoon is, to use the obvious pun, a strange beast. 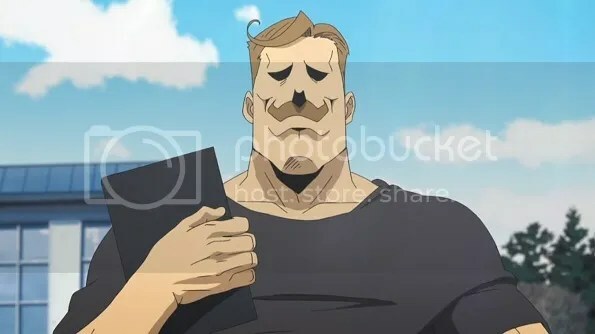 It’s an adaptation of a manga written by the acclaimed Arakawa Hiromu, who some may know as also being the author of the runaway success Fullmetal Alchemist. Curiously enough Silver Spoon is not at all and action-packed steampunk shounen, going in the exact opposite direction as a much more down-to-earth offering, and in more ways than one. I couldn’t actually find a lot of crossover pictures (and fan art in general, actually), which is a sort of travesty. While an agricultural slice-of-life after an adventure fantasy like Fullmetal Alchemist may be a strange direction to go, it is not entirely non sequitur. 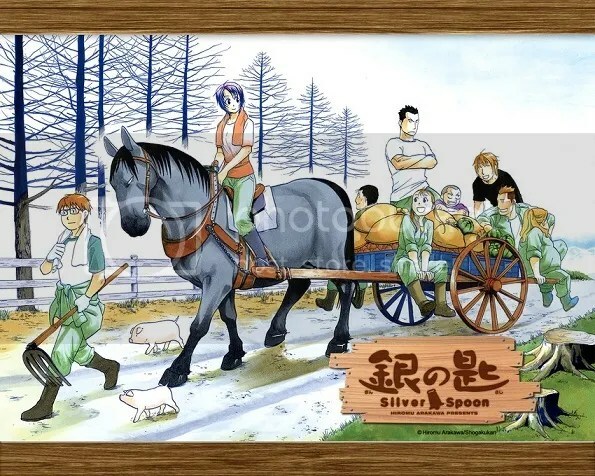 Silver Spoon is exactly the kind of work that the mass popularity of Fullmetal Alchemist allows (not that Silver Spoon is not incredibly popular in Japan as well); after a commercial success of that level I guess you’re pretty much allowed to do whatever you want. Silver Spoon is a deeply personal tale, drawn from Arakawa’s own rural childhood, and filled with a proportionate amount of heart. Due disclosure: As an agricultural school alumnus myself my views on this show are unavoidably skewed. 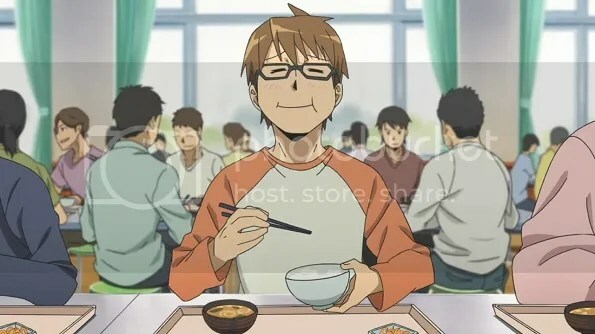 If you really want to take it apart, Silver Spoon is a somewhat formulaic show, featuring a plain Everyman thrust into a foreign environment, who drives the fish-out-of-water comedy as he slowly adapts to his new life. Put into practice, though, it turns out to be a rather refreshing experience. 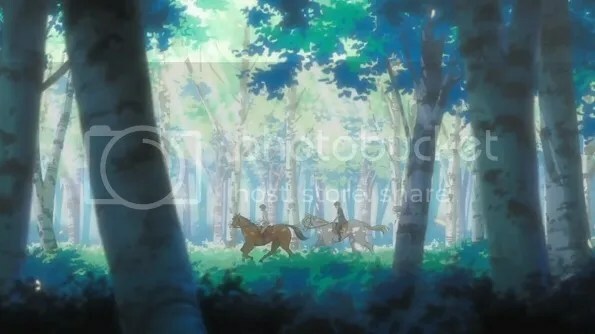 Agricultural high school is a unique spin to the usual anime setting, but is still warm and inviting rather than alien. The supporting cast are earnest, friendly and positive, contrasting the seemingly increasingly cynical and disillusioned generation of today. And they get horses. We never got horses. I feel cheated. The generally optimistic atmosphere facilitates Gin no Saji‘s central theme: dreams. We have the directionless male protagonist Hachiken Yuugo in contrast with his classmates, who each have come to their new school with a vision of the future and a goal in life. On another level Gin no Saji appeals to the urbanite’s dreams of a simple rural life, channelling the Arcadian ideals of the agrarian utopia. It is not that life on the farm was ever portrayed as being rosy–it’s explicitly hard work every day–but it’s still a romantic idea, even putting aside the high school setting. There is something innately appealing about being rewarded for the sweat of your brow, converting effort into tangible results (equivalent exchange?) and the simple pleasures of food and companionship. Consider, for example, every Harvest Moon game ever. Also, using a hoe like that will get someone killed. Combined with solid comedy, a romantic subplot and pleasing aesthetics, the first two episodes of Gin no Saji have been an enjoyable, soul-soothing watch. At the very least it’s a change of pace from the non-stop octane-fuel of modern media. A-1 Pictures usually gives their adaptations a lot of respect; I expect Gin no Saji to continue giving a good showing from here. 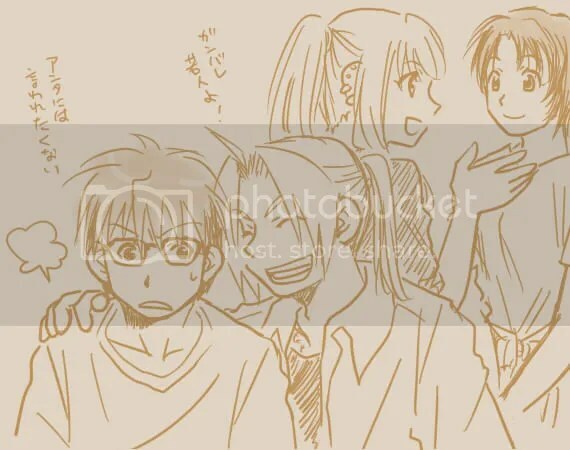 This post is also in remembrance of Utsumi Kenji, notably the voice of Major Alex Louis Armstrong from Fullmetal Alchemist (inter alia), who lost his fight with cancer on 13 June 2013. Todoroki-sensei was the final role of this great voice in the industry.